I believe it was Albert Einstein who said that insanity is doing the same thing over and over and expecting different results. I can only assume that he was talking about parenting. When you read the parenting books it all seems so simple. If you shepherd your child’s heart, and don’t get angry, and get to the heart of the issue, and get them to apologize, your kids will be obedient, godly, and full of good hygiene. It’s a perfect formula. But it never works out that way. My daughter, Charis, is four, and she has a Jedi black belt (which is one notch above a black belt) in the skill of whining. Jen and I have been working with her on the issue of whining since, like, infinity ago (see Napoleon Dynamite), and I don’t see the issue going away any time soon. talk about doing all things without grumbling or questioning. We talk about a cheerful heart being like good medicine. We talk about being respectful to mommy and daddy. And yet she still whines. I do the same thing over and over. I expect different results. Sounds like insanity to me. My dad could say the same thing about our family devotions time when we were growing up. Dad fought the same battle every morning. DAD: Stephen, I want you to sit up and open your eyes when I’m reading. I don’t want you sleeping. ME: Dad, I’m not sleeping. I can listen better laying down. DAD: Stephen, drool is leaking out of the corner of your mouth. You’re sleeping. Please sit up! ME (rolling eyes): Alright. But I really can listen better laying down. DAD: Okay, what did I just read about? ME: About Jesus. The Bible. God. When will we reap the benefits of our work? When will we actually see a different result with our children? When will Charis learn to stop whining? In “due season”. When God takes the truths that Jen and I have been communicating to her and makes them stick. When God, by the power of his Holy Spirit, moves her little heart to do all things without grumbling or questioning. We do the planting, God does the growing, and in due season we see the fruit. 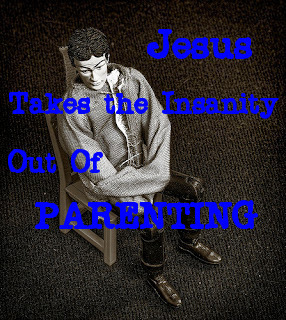 Parenting is not insanity because Jesus takes the insanity out of parenting. My dad didn’t see immediate fruit in me. He faithfully did devotions with us for our entire childhood, but he didn’t really start seeing fruit in me until I was about fourteen years old. But he stuck with it. He didn’t grow weary in doing good. He didn’t let the apparent lack of fruit cause him to give up. He kept doing devotions. He kept pointing me to Jesus. He kept correcting me where necessary. And finally, after a number of years, the Holy Spirit brought all those things together and made them click. Sometimes the due season is a month. Other times the due season is twenty years. Don’t give up. Parenting feels like insanity but it’s not. Jesus takes the insanity out of parenting. Okay, so how did you know that was just the verse I needed to hear this morning? Thank you. I thought that happened only at my house. 🙂 Thank you for the encouragement. My 6 month old has worn both the large and the one size since he was 3 months old. My almost 3 year old daughter can fit the large which is great to know because my son should be able to wear these till he's about 3! They absorb great and that yellow/green new baby poop washes out great.